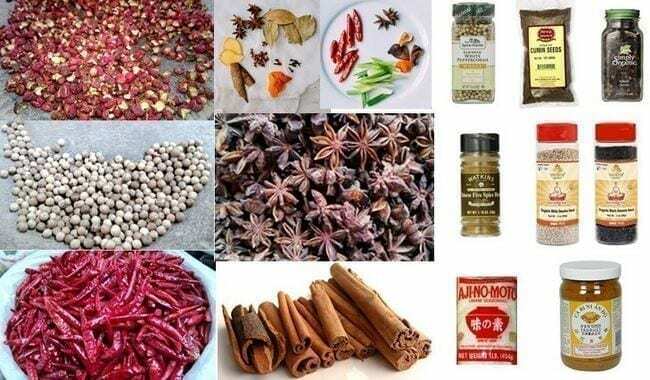 Dry Chinese Spices is definitely a category of its own, and we tried to make just a small dent in the vast amount of spices and herbs used in Chinese cuisine by listing some of the ones we use most often in our kitchen. But if you don’t see what you’re looking for, just give us a shout via email or comment and we’ll do our best to help! If you’re looking for a different ingredient, be sure to check our Chinese ingredients glossary main page where you can easily locate what you’re looking for. What can we say about this? Salt is the foundation of all cooking. Oftentimes, Chinese food is blamed for having too high a salt content, but we’ve found that this is really only the case in restaurants as opposed to home cooking. Restaurants want to make their food tasty, so you can’t really blame them. We like to use coarse sea salt or Kosher salt, but whatever you use, just remember that saltiness levels can vary greatly among kinds, so it’s essential to taste often while cooking! By now you’re probably scratching your heads as to why we’re talking about an ingredient as basic as salt, but some of the tastiest dishes use salt as a star ingredient! There’s Salt and Pepper Squid, Salt and Pepper Shrimp, Cantonese Salt and Pepper Pork Chops, and our favorite Three-Ingredient Grilled Chicken Wings! Depending upon the type and region of the dish you’re cooking, you may use soy sauce or other sauces as your primary source of saltiness. For example, Shanghai dishes use soy sauce liberally, so less salt is used in those recipes than in Sichuan and Northern Chinese cooking, where it’s the other way around (more salt, less soy sauce). The beauty of cooking at home is that you have the option to balance the amount of salt used and you can enhance your dishes in other ways. In many of our recipes, we simplify the ingredients list to use granulated or brown sugar when the actual recipe should use rock sugar. 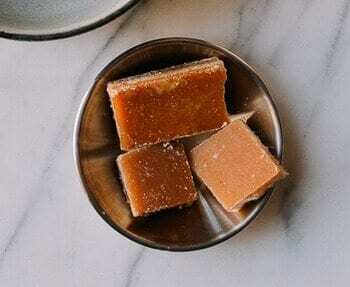 We still use rock sugar or bīng táng (冰糖) which is similar to jaggery, in our kitchen when we have it, but, truthfully, using granulated white or brown sugar instead only makes a minimal difference, so convenience wins out if you don’t have rock sugar in the pantry! 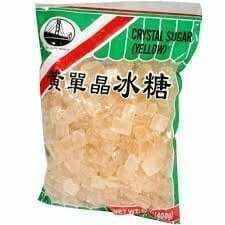 But rock sugar is a key ingredient in many dishes, including Judy’s Shanghai Braised Pork Belly, Grandma’s Red Cooked Pork, Shanghai Sweet and Sour Ribs, and Chinese Braised Oxtails. In short–some of our tastiest recipes!!! So if you have some rock sugar around, are feeling the pressure of tradition, or if you’re just looking for the perfect sheen on your pork belly dish, give it a try! Rock sugar also comes in these brown sugar pieces and is call bing pian tang (冰片糖) or literally rock sugar slices. They are both called rock sugar in Chinese because they come in a large solid form but other than that, I have no explanation. 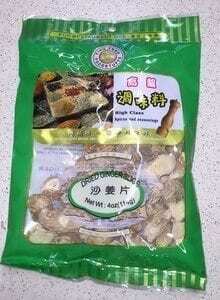 This brown rock sugar is used quite often when making Sweet Nian Gao for Chinese New Year. Here you can see some brown rock sugar pieces opened and ready for use. 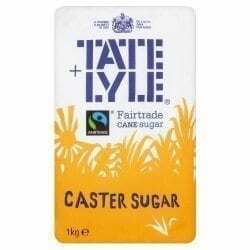 Caster sugar or shā táng (砂糖) has a consistency that falls somewhere between granulated and powdered sugar. It’s difficult to find, but if you have a food processor or a good blender, you can actually make it yourself. Just place granulated sugar in the processor or blender and whizz it until it gets to a superfine but not powdered state. You’ll need it to make Coconut Cocktail buns and Pineapple Buns! 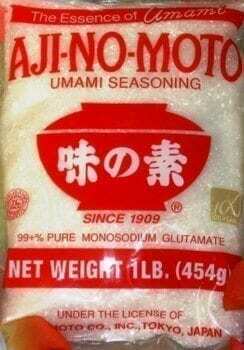 MSG or wèi jīng (味精) is a reproduction of naturally occurring glutamates (sometimes referred to as the 5th taste, umami). 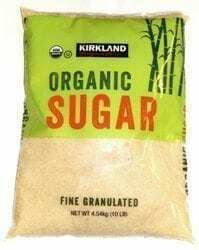 It intensifies flavor and is used in many processed and restaurant foods. You can read more about the details in the Wikipedia article on MSG (http://en.wikipedia.org/wiki/Monosodium_glutamate). Of course, we don’t have to tell you that MSG is much-maligned in the food world, even though it is technically naturally occurring. Even so, there are other ways aside from MSG to make your food delicious, which is the reason why we don’t use it in any of our recipes here at The Woks of Life. 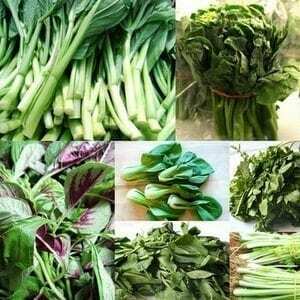 When we eat out at Chinese restaurants, however, we can often tell when it is used, especially in stir-fried green vegetables. We’re not gonna lie–there is definitely an improvement in taste! The older generations in our family used to joke around about using it in the kitchen. They used to say, “maybe you have to add some si-fu (master) to make it better!” implying that a dash of MSG is like adding a touch from the master chef! Funny eh? If you don’t have any adverse reactions to MSG, you may want to try it after reading more about it. Either way, if you eat processed foods, or use any prepared spice mixes, chances are that you are already consuming it in small quantities. You can actually buy it on Amazon, and we found this “best selling” brand; so if you want to experiment, you can buy it. But like all of the products listed on our ingredients pages, this is by no means an endorsement from us! White pepper or bái hú jiāo (白胡椒) is used in Chinese cooking like black pepper is used, well… for all other cooking! We use fresh ground white and black whole peppercorns for all of our cooking unless we are making larger amounts of dry rub and marinades. The white peppercorn has a distinctly different taste than the black peppercorn and is always the preferred choice for Chinese cooking unless otherwise specified. We’re actually not sure why this is the case, but some things just are the way they are; this is one of those things. A little-known fact is that white and black pepper both come from the same plant but are processed differently to yield different flavors. White pepper has a much hotter taste that follows right down to the back of your throat, giving a prominent flavor to soups. White peppercorns are a little harder to find, but any well stocked Asian grocery store will have it or you can buy on Amazon in a pinch! 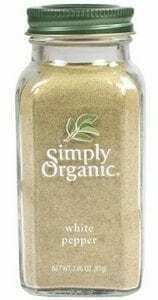 We keep a small bottle of ground white pepper in the pantry for convenience but almost always use whole white peppercorns in a grinder. Known for the slight numbing sensation it leaves on the tongue, the Red Sichuan (Szechuan) peppercorn or hóng huā jiāo (花椒 ) gives Sichuan cuisine its distinctive flavor. Funnily enough, it’s actually not a peppercorn at all, but a berry from the prickly ash tree. It’s used both in whole and ground form and is one of the ingredients in 5 spice powder. The Sichuan peppercorns pictured below are the red or “regular” variety that we use in most of our recipes. Kaitlin uses both in her popular Ma Po Tofu recipe. Notice that these peppercorns don’t have any seeds in them–it’s just the husk of the berry–and they have a vibrant color which indicate they are of higher quality. Avoid ones that are dark brown or black and have a lot of seeds and stems because they tend to be gritty, dirty, and are generally unpleasant to eat. We use Sichuan peppercorns whole much of the time, but you can also grind them with a mortar and pestle or with a spice grinder. When using them, be sure to pick out any stray stems and shake off any dust in a strainer before using them. You can also buy ground Sichuan peppercorns as well, but we recommend using a mortar and pestle to grind your own as needed to ensure a strong flavor. When you open a bag of peppercorns for the first time, you should get a strong flowery and peppery aroma from these peppercorns. The second test of freshness is biting into one of the peppercorns; you should definitely taste the spice and feel the numbness! Did you know that the “ma” in Ma Po Tofu means “numb” in Chinese? If you like Sichuan spicy food, this is a must for your pantry! Some of our favorites of Judy’s is the Sichuan Stir-Fried Potatoes and Sichuan Three Pepper Chicken. 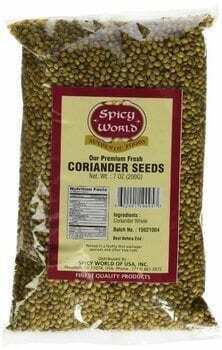 Go check them out and you’ll be convinced you need to get a bag of these peppercorns. You can find these at a new internet vendor specializing in high quality Sichuan spices and sauces at Spicy Element and in particular, you can find these Red Sichuan Peppercorns for purchase from Spicy Element HERE. If you want to shop around for Red Sichuan Peppercorns, Click HERE to Shop for Red Sichuan Peppercorns on Amazon. Known for the slight numbing sensation it leaves on the tongue, the Green Sichuan (Szechuan) peppercorn or qīng huā jiāo (花椒 ) seem to be even more numbing than the red ones! Green Sichuan Peppercorns have a stronger aroma and retain their green color after they are ready to harvest and dried. 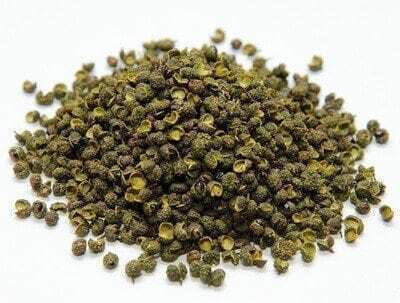 Pictured above in their loose form, you can purchase these high quality green Sichuan peppercorns at Spicy Element. Good quality Sichuan peppercorns should have a dark green color with little or no stems and dust. Once opened, you will smell their flowery fragrance. Keep them in a sealed plastic bag or a sealed jar and use them often so they are fresh! 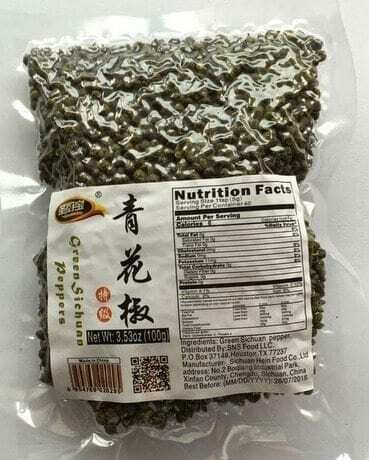 Click HERE to purchase these Green Sichuan Peppercorns directly from Spicy Element. If you want to shop around for Green Sichuan Peppercorns, Click HERE to Shop for Green Sichuan Peppercorns on Amazon. 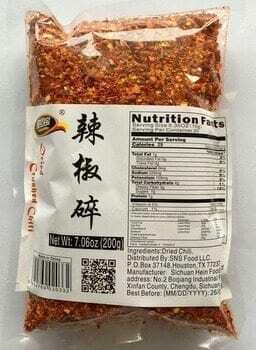 Sichuan huā jiāo fěn (花椒粉) or also called huā jiāo miàn (花椒面) as you see on the label below, is great to have in your pantry if you like spicy Sichuan food. Also, for those of you who don’t like biting into whole Sichuan peppercorns (I know some of you do!) 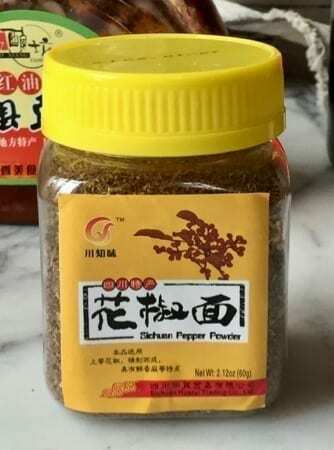 or if you need a dash of ground Sichuan peppercorns, buying Sichuan peppercorn powder is a great solution. 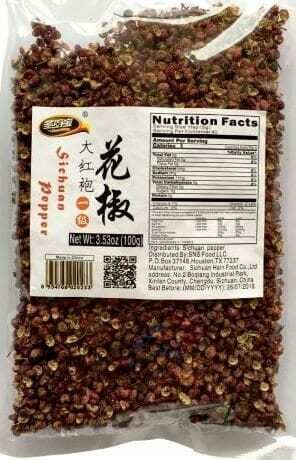 In fact, the more I use this brand of ground Sichuan peppercorn, the more I like it. It’s super convenient and you never have to worry about that biting into that numbing peppercorn. Dried Red Chili peppers or gān hóng là jiāo (干红辣椒) come in a vast number of varieties–too many for us to keep up with. In general, the smaller the chili, the hotter they are. A lot of Chinese dishes call for either long hot green peppers or small red chilis, both of which can be found in any grocery store. 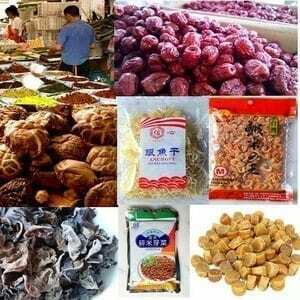 Hunan and Sichuan cuisine also make use of the dried red chili pepper, which can be found in most Asian groceries. Not all dried chili peppers are created equal. 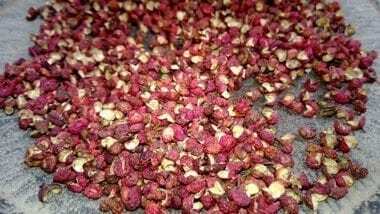 We have seen those sold in the Sichuan region of China that have a deep red color and others that have a more washed out red color. Color is important for making red chili oil and Sichuan dishes but I think it is second to flavor. I suggest buying smaller packets to experiment with brands but to also ensure that they stay fresh in your pantry. 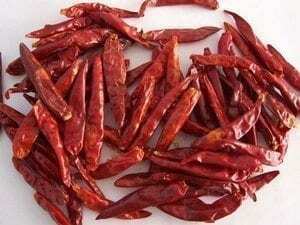 We use dried red chili peppers in many of our recipes both whole and ground up. Dried chili peppers, when toasted properly, are pleasantly fragrant and addictively tasty! Dumplings and pan-fried buns must be eaten with a homemade sauce made of raw garlic, toasted chilis, soy sauce, and a dash of vinegar. Check out our Chongqing Chicken Recipe, which uses ample amounts of dried red chili peppers. Just remember that these chilis are just for flavor and aroma, NOT for eating whole (unless you want a whole world of hurt). But fear not, a few dried red peppers here and there don’t turn anything insanely spicy. Small quantities simply round out flavors and add complexity. Sometimes we add just a few for the toasted pepper flavor with a hint of heat, like in our Orange Chicken; sometimes we add more for a little extra spice, like we did for Chinese Eggplant with Garlic Sauce. These Thai chili peppers look more like the variety we saw in Chengdu that have a deeper red color in case you don’t have access to these ingredients at an Asian grocery store. Thailand definitely knows their chilis! This chili powder or Làjiāo fēn (辣椒芬) is crushed but not fully pulverized and is perfect for making chili oil. There is some powder and some crushed pieces, the perfect texture for chili oil and seasoning meats. The powder produces a rich red color and the coarser flakes add a great look and texture. You can make our Homemade Chili Oil, one of the key additions to our popular Lanzhou Beef Noodle soup. For some applications and sometimes for convenience, we use a good quality crushed red pepper which works if you can’t locate the right dried peppers. We get the huge container at Costco, because, obviously, we are people who enjoy spice. Just remember that these Italian-style crushed red pepper flakes should only be used if you can’t find the brands from the Sichuan region of China. The differences in flavor and color make a huge difference in the quality and flavor of chili oil! Try your best to locate the brand or similar product pictured above in your local Asian store if you’re looking to achieve the most authentic taste and look. 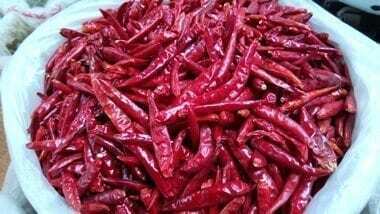 We found a direct mail order source, Spicy Element for authentic imported Sichuan chili peppers and in particular the crushed chili pepper for making Homemade chili oil or Homemade Chiu Chow Chili Sauce. 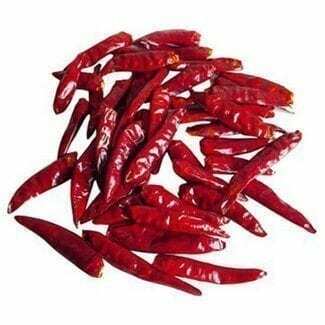 Click HERE to buy Sichuan Crushed Red Chili Peppers direct from Spicy Element. We also use Cayenne red pepper powder and sometimes use a Korean red chili powder for cooking and marinades. 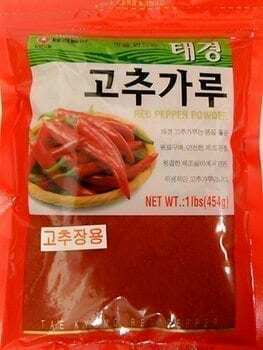 Korean red chili powder and flakes does have a different flavor, however–we find that it’s slightly sweeter. If you’re a spicy food lover, you can buy a whole pound of it on amazon and use it for all of your cooking. 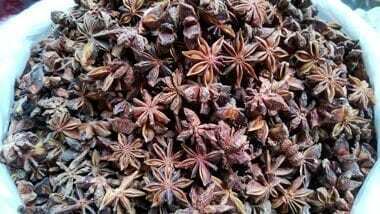 Star anise or ba jiao (八角) plays a key role in slow-cooked dishes and is also one of the spices in 5 spice powder. Look for whole pieces that aren’t broken up and store them it in a sealed container in your spice cabinet to keep them fresh. 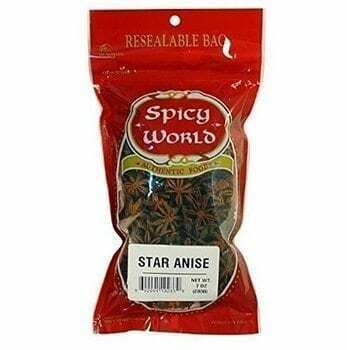 Star Anise is an essential ingredient that provides its distinctive taste in dishes like Chinese Braised Oxtails, Soy Sauce Chicken and Lanzhou Beef Noodle soup, just to name a few. There are a variety of brands and suppliers that you can shop and compare on Amazon. 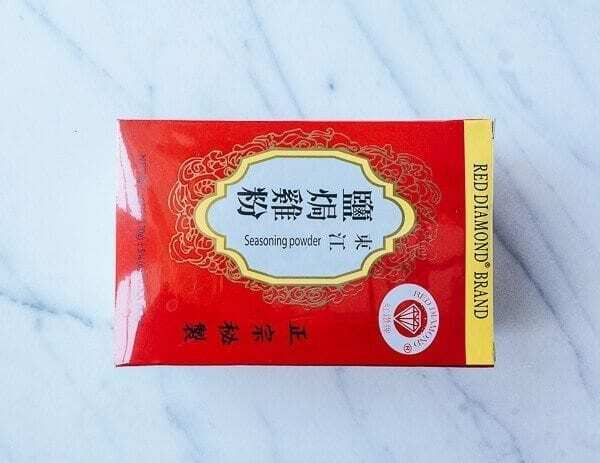 This famous 5 spice mixture or wǔxiāng fěn (五香粉) is usually made from Sichuan peppercorns, fennel, cloves, star anise, and cinnamon but the spice can vary depending upon the brand. The blend combines the five primary flavors of Chinese cuisine: sweet, sour, pungent, bitter, and salty. It is widely used in Chinese cooking and is occasionally set out on the dinner table mixed with salt and pepper for adding flavor to certain chicken dishes. It’s usually used for marinades and dry rubs for meats. Sometimes we add an optional pinch for a touch of spice in dishes like fried rice and lo mein. Our favorite applications are five spice fried chicken, roast chicken, Chinese ribs, roast pork, roast duck, and this insanely amazing Roasted Chicken with Sticky Rice dish that will blow your mind. Try a more basic yet tasty weeknight dinner dish like Easy Five-Spice Baked Chicken or just some no-nonsense Five Spice Fried Chicken. Dried tangerine and citrus peels, commonly referred to as guǒpí (果皮) or “fruit skin” in Chinese, are a widely used spice in Chinese cooking. It is used in dishes like Tangerine beef and Orange chicken but also in soups, stews and braised dishes like Braised Duck. 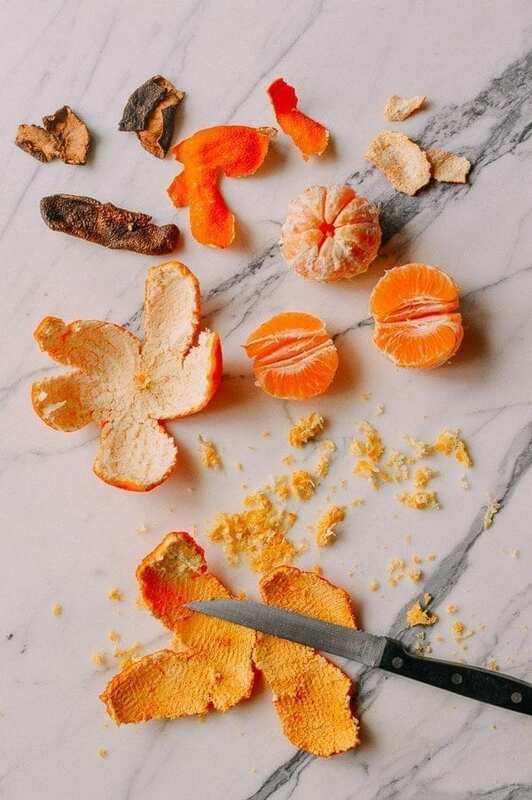 Look at the picture below and you will see store-bought dried orange peels in the upper left hand corner which over time have turned into a darker color. Right next to it is fresh tangerine peel which has been dried for a couple of weeks that still retains its vibrant color. At the bottom of the picture you can see how we scraped away the pith to dry or to use immediately for Tangerine beef. You can try drying your own or buying it from your local Chinese grocery store. 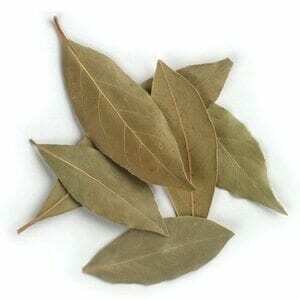 Bay leaves or Yuèguì yè (月桂叶) are use widely in all types of cooking. Chinese stews and braising liquids call for this aromatic bay leaf which is more commonly known as xiāng yè (香叶). 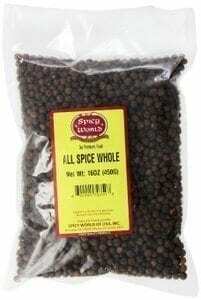 Allspice is sometimes confused with a mixture of spices but in fact is a dried aromatic fruit of the West Indian tree. Sometimes called Jamaican pepper, it is sometimes used in Chinese cooking and incorporated in some traditional dishes like Chinese New Year Nian Gao. Curry powder or gālí fěn (咖喱粉) is a spicy powder made by grinding and blending various herbs and spices, including cardamom, cinnamon, cumin, cloves, fenugreek, red peppers, and nutmeg. There are a lot of different curry powders available but we do like a good Madras curry powder for our Singapore Mei Fun Noodles and Coconut Curry chicken. We also frequently use canned curry pastes, which have a more concentrated flavor in smaller quantities. Madras curry powder has a fragrant taste and rich yellow color great for any dish, and we use this brand from the local Asian grocery. We have not found where you can buy just one on Amazon but you can search from the link below! 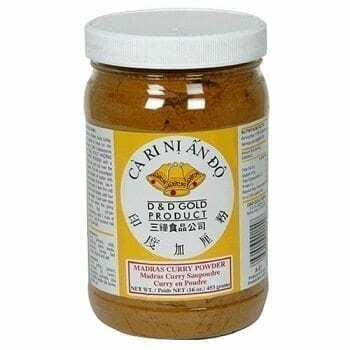 Turmeric powder or huáng jiāng fěn (黄姜粉) is an essential ingredient in all curry powders and provides most of the yellow golden color and also is a healthy herb. Adding extra turmeric powder enhances the color of a good curry dish and can also be used in place of food coloring when a nice yellow color is desired. 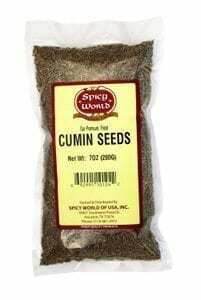 Cumin zī rán (孜然) is an aromatic seed used to flavor sausages, chutneys, and a variety of Indian, Asian, and Latin American dishes. We cook quite a few Latin American dishes so cumin powder is always in our pantry. We also keep whole cumin seeds since there are many Chinese dishes that call for it and we also like using the mortar and pestle and grinding freshly toasted cumin seed into a fragrant powder rather than using the pre-ground variety. 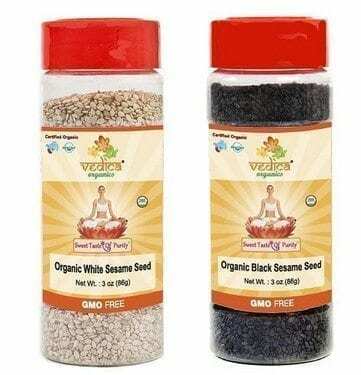 Generally, you can find whole seeds at the local Indian or Asian grocery store but for convenience, you can just order it and have it delivered to your door! 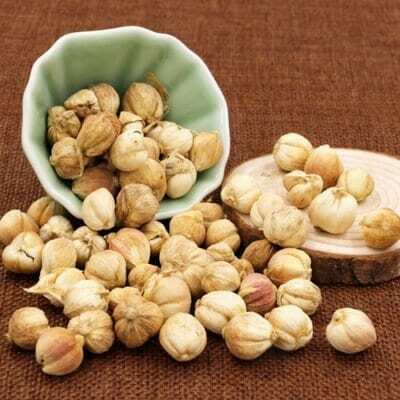 Fresh coriander or cilantro is used in many Chinese dishes but coriander seeds or yán suī zi (芫荽子) are rarely used. Instead, we have them listed here for our pantry when cooking international dishes like Indian lentils. You are probably most familiar with the taste of fennel seeds in Italian sausages and also in Indian cuisines but they are also used in Chinese cooking. Fennel seed or huí xiāng zǐ (茴香籽) is one of the spices used to make 5 spice powder! We use whole fennel seed in Lanzhou Beef Noodle soup. Also called cassia cinnamon, this is unlike regular cinnamon in color as well as thickness. The more common name in Chinese is guì pí (桂皮) but it is also known as ròu guì (肉桂). These Chinese translations of these different varieties of spices like cinnamon can be really confusing! Chinese cassia cinnamon is thicker, grayer, and more closely resembles tree bark. This is also one of the main ingredients in five-spice powder. 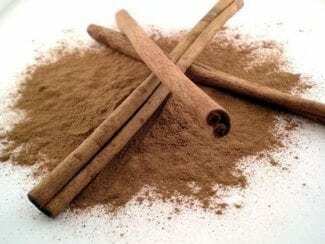 In general, Chinese cinnamon sticks, gui pi, are less fragrant than regular cinnamon. It’s mostly used for braised dishes, stews, and marinades in Chinese cooking. 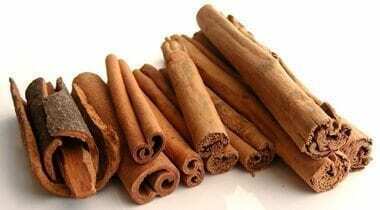 But you can use a smaller amount of the higher quality and more fragrant cinnamon sticks, rather than using the Chinese variety if you can’t track any down. Remember, however, to use a bit less, or the cinnamon flavor will come through too strong! Chinese recipes where we use gui pi include the Taiwanese Braised Pork Rice Bowl (Lu Rou Fan), Big Plate Chicken (Da Pan Ji), and even Pho Noodles! Cloves or dīng xiāng (丁香) have very strong, pungent, and sweet aroma and is one of the five spices that make up five spice powder. 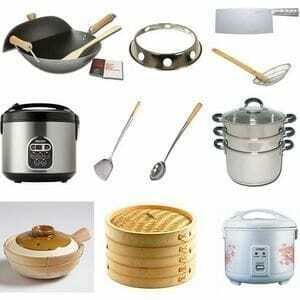 It can be used whole or ground up and is widely used both Asian and Western cooking. We like to buy whole cloves and grind them as needed or just let whole cloves infuse dishes like Homemade Chili Oil. They also add great flavor to curry dishes like Beef Rendang. Cardamom or hēi dòukòu (黑豆蔻) is an ingredient that you probably think of when cooking Indian dishes, but they also have their place in Chinese and Southeast Asian cooking. Green cardamom is seldom used, but black cardamom adds an extra dimension of flavor to stews and noodle soups like Lanzhou Beef Noodle Soup and Pho Vietnamese Noodle Soup. Amomum white cardamom, sometimes called Thai cardamom is used throughout China and Southeast Asia for its floral aromatic flavors. It is sometimes ground and used in curry powder but often used in braising liquids and aromatic soups like Judy’s Braised Beef Noodle Soup (红烧牛肉面). It looks like a small dried chickpea but it is in fact, a soft pod with seeds inside. The white cardamom has a hint of menthol flavor and does wonders for adding a unique flavor to your dishes. 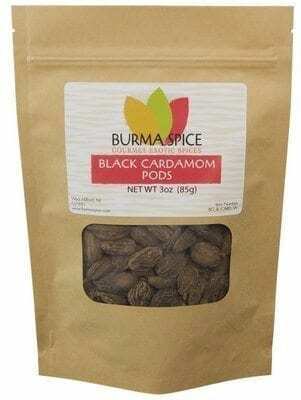 Click HERE to buy white cardamom direct from Spicy Element. 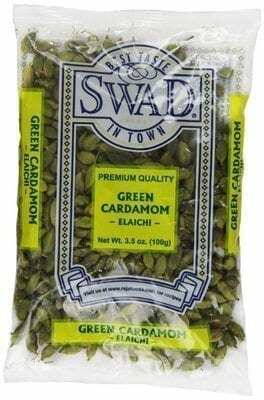 Green cardamom is most commonly used in India dishes but also used in some Malaysian and Southeast Asian dishes due to the influence from Indian cuisine in these areas. Dried Sand Ginger (shā jiāng or shānnài) is different from your regular variety of Chinese ginger and is part of the galangal family and sometimes referred to as aromatic ginger. A side-by-side comparison of sand ginger powder or shā jiāng fěn (沙薑粉) with ginger powder, jiāng fěn (薑粉) will find that they taste and smell quite different as they are different varieties of ginger. 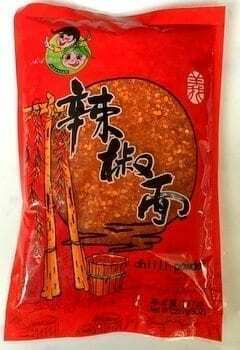 Here is a picture of dried Sand ginger powder – you can see that the Chinese characters on the package match 沙薑粉 or shā jiāng fěn meaning Sand ginger poowder even though the packaging says ginger powder. 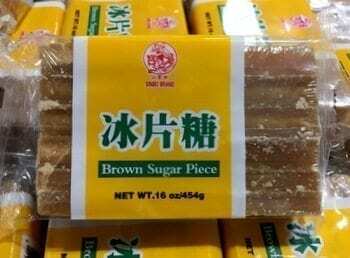 We also buy dried sand ginger slices from our local Chinese market but if you look closely at the packaging, the English words say dried ginger slices but in the Chinese characters, it is actually sand ginger slice 沙薑片. Now that’s confusing, which is why we provided the Chinese characters for each varieties in the powder and the slice form. Use these Chinese characters when shopping for this ingredient! 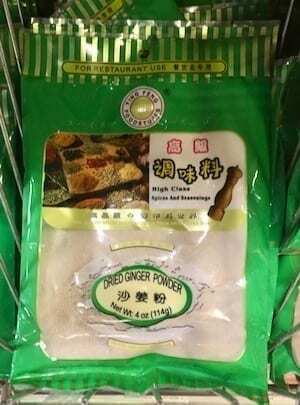 Organic ginger powder of jiāng fěn (姜粉) is a must have item in your pantry for baking and Chinese cooking. Galangal or Gāoliáng jiāng (高良姜) is used mostly for Southeast Asian cooking and sometimes referred to as Thai ginger. It is also known in Chinese cooking as sand ginger or shā jiāng 沙薑. Our experience is a bit limited, but we hope to introduce more recipes using this very fragrant spice like our Easy Asian Dry Rub Chicken. It’s also sold fresh–you can see the picture on our Chinese Aromatics and Peppers Ingredients page. 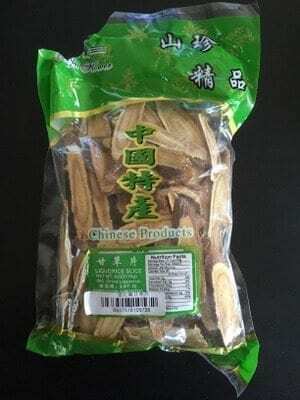 Chinese Licorice root or or gān cao (甘草) is a very common ingredient used in Chinese herbal medicine but it is also used to flavor broths and braised dishes. Most people are not familiar with the uses of this aromatic ingredient and have never used it before but we hope that this package helps you identify this ingredient in Chinese grocery stores. We forgot to take a picture of this package before using it so don’t mind the rip in the upper corner of the bag! Check out our Lanzhou Beef Noodle Soup(spicy) and Braised Beef Noodle Soup (红烧牛肉面) (not spicy) which used Chinese Licorice root in both of these noodle soup dishes. Sesame seeds or zhī ma (芝麻) are an essential pantry item for Chinese cooking. Sometimes used for sweet treats and sometimes for accent or garnish, they add a great nutty flavor and crunch. We use sesame seeds liberally in our kitchen. They’re the star of dishes like Sweet Sesame Crisps, Chinese Sesame Peanut Brittle, or Cold Sesame Noodles. There are various colors of sesame seeds available and both white and black seeds are used in Chinese cooking. It’s best to store sesame seeds in a tightly covered container in the refrigerator after opening, but if kept in a dry and cool area, it also keeps well in the pantry. Sesame seeds are quite heat tolerant, so, lucky for us, it’s actually not easy to burn sesame seeds. So sprinkle away for a crunchy garnish! Toasted and non-toasted sesame seeds are readily available in Asian markets. We like using the toasted seeds for a quick and easy garnish sprinkled over dishes but we also have raw seeds on hand for baking and cooking. 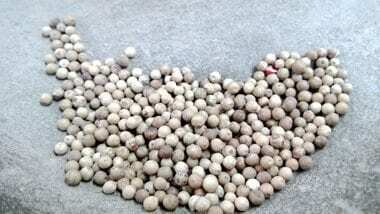 You can find white and black sesame seeds as well. If you’re having trouble finding sesame seeds, we found one brand here that bundles both white and black, but, as always, check out what you can find near you! You can also buy these in larger 1 pound bags if you decide to make Tang Yuan (Sweet Rice Balls with Black Sesame Filling). Salt Baked Chicken powder or Yán jú jī fěn (盐焗鸡粉) in Mandarin and Yim Gook Gai Fen in Cantonese is a quick and easy way to marinate and make roasted Chinese salt baked chicken. This salt baked seasoning packet is widely available in Asian grocery stores, one of which you can see below. A key ingredient in this mixture is MSG which is one of the reasons why baking a chicken with this seasoning packet would yield a tasty bird. Another key ingredient is sand ginger powder or sand ginger powder (沙姜粉, sha-jiang-fen) that has its own unique signature taste. Judy has a recipe for an authentic Salt Baked Chicken recipe that uses the necessary spices (without MSG) baking the chicken in salt – yes, it’s the real deal for sure. We also have a recipe that we call Oven Baked Asian Dry Rub Chicken which uses chicken thighs and similar spices and actually tastes really close to the authentic salt baked chicken but is a whole lot easier to make. Steamed meat rice powder or Zheng rou fen (蒸肉粉) is used in steamed meat (usually pork) dishes with rice powder called fen zheng rou (粉蒸肉) in Mandarin. For your reference, Zheng rou fen (蒸肉粉) literally means steamed meat powder in Chinese. Fen zheng rou is a popular dish originating from the Jiangxi province of China but also very popular in other parts of southern China as well. Meat is pan fried, coated in seasoned toasted rice powder and steamed before serving. You can see how to make rice powder from scratch in Judy’s Steamed Pork with Rice Powder (Fen Zheng Rou) recipe or you can simply buy the pre-packaged versions from your local Asian grocery store. 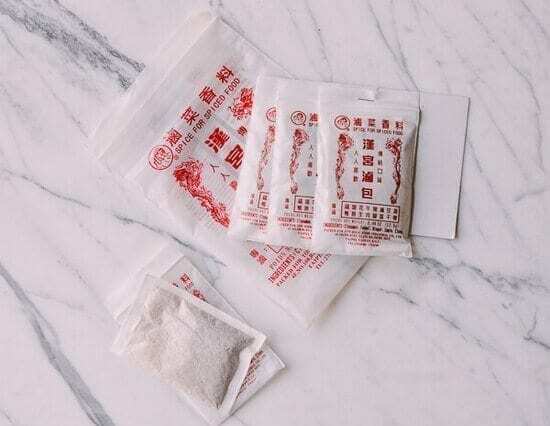 These rice powder or zheng rou fen packets can make a very tasty dish but like most prepackaged spice packets, they do contain additives including monosodium glutamate or MSG. 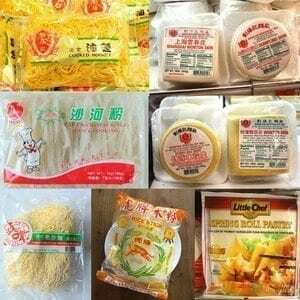 You can see from the photo above that rice powder or zheng rou fen (蒸肉粉) packets come in two flavors. The box on the left is a five spice or wu xiang (五香) flavor and the one on the right is spicy flavor or la wei (辣味). If you have trouble seeing that the Chinese characters match what we provided in this the text written here, you can always show the picture to someone at the Chinese grocery store! Lu Liào Bāo (滷料包) or Lu Cài Xiāng Liào 滷菜香料 translates into braised dish fragrant material and is a premeasured packet of Chinese spices for making a braising liquid. Lu generally refers to a spice flavored brine used for braising although one of the direct translations I have seen is bittern, which is a bitter tasting solution extract. That said, I think we’ll go with the translation, brining or braising packet. 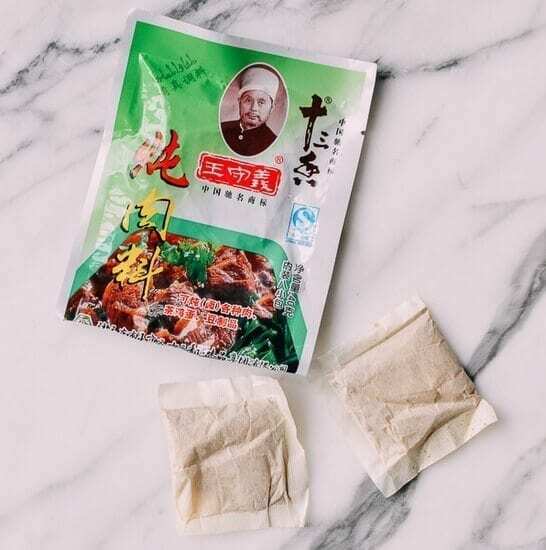 Chinese spice braising packets contain a variety of spices but usually Chinese cinnamon, cardamom pod, Sichuan peppercorn, star anise pod, cloves, dried tangerine peel, bay leaves, whole white peppercorn, dried liquorice slices, nutmeg, and fennel seeds. If you have an extensive spice collectio in your pantry, you can make your own spice packet taylored to how you like it or simply purchase one and use it for Chinese spice tea eggs, Chinese braised beef shank or Roasted braised duck. 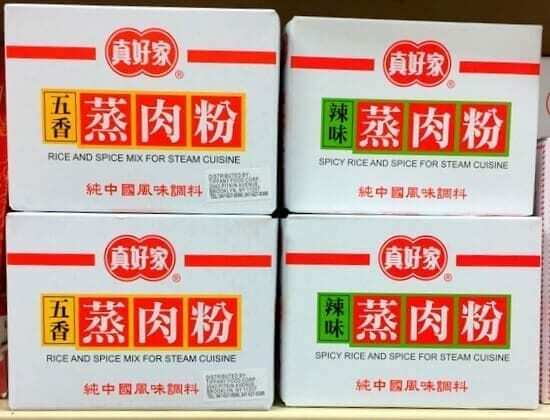 Another name for Chinese spice braining packet is Dùn Ròu Liào 炖肉料 which translates directly into stew meat material. That’s actually a pretty accurate translation as these spice packets are used mostly for meat dishes. So there you have it – use the Amazon link above or have your phone handy and show these pictures and Chinese characters to the manager when you go to your local Chinese grocery store folks! Thank you for this info! How many times have I blocked a shop aisle as I looked at these packets wondering what they were and what they were used for? I wish I’d found this page earlier. You have a great website. Love it. You can find the Knorr Brand powdered Chicken Bouillon in many places, including most grocery stores and Family Dollar. However, the jars are small. 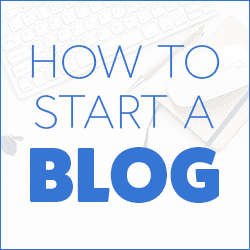 Walmart and Sams Club, have the large, economy sizes, which are MUCH MUCH CHEAPER and give you so much more product The economy size comes in Beef and Chicken flavors. This is my preferred brand, as it has a meatier flavor and seems less salty than other brands. By the way, I don’t use gravy mixes, except for 1, Knorr brand Pork Gravy. It’s hard to find, and I usually have to special order it. When pork roast drippings are added to the gravy, it’s SO flavorful. Sometimes I add in some crushed green peppercorns for added interest. Delish! Thank you so much for your detailed pictures and wealth of information, not to mention amazing recipes! I’m living in Shenzhen, and the translations and pictures will save me so much time when I’m searching for ingredients and asking for help with my terrible Chinese. Your blog is saving this Laowai.. I’m allergic to MSG and love trying all the dishes here so much, but haven’t been able to enjoy as many of them as I’d like in restaurants since ‘the master’ is used so frequently. XièXiè!!!! I am looking for chicken powder/chicken flour. Could you enlighten me on a brand? Hi james, Knorr’s makes chicken bouillon and chicken powder.